Adults- Which Toothpaste Should I Use? Did you know that toothpaste were in use since 5000BC? If you looked into the ingredient list back then, you might come across things like powdered ox hooves, ashes, crushed bones, and burnt eggshells. Thankfully, we have progressed a bit further and have nicer tasting toothpaste these days! A question that often gets asked is “Which toothpaste should I be using?”. Given the number of options available at the supermarket, it’s not surprising that we get overwhelmed! For people with a low risk of dental decay, your regular fluoride containing toothpaste is sufficient. It is important to brush at least twice daily (once in the morning and once at night before bed). These toothpastes can be more effective in removing extrinsic stains. They work in two ways: they are more abrasive and so can actually lead to teeth appearing more yellow if overused and the outer enamel layer of the tooth is abraded away, or they contain hydrogen peroxide which is a chemical bleaching agent. Apart from toothpaste, there are also other ways of achieving whiter teeth (such as dental bleaching or veneers). Let us know if this is a concern, and we can explore the options! These toothpastes can are fantastic in reducing dental sensitivity. They either form a physical barrier to protect the root surface or act directly to change the sensitivity of the nerve in the tooth. When trying new sensitivity toothpaste, you should give it at least two weeks to start taking effect. As with all toothpastes, the recommendation is to spit not rinse. Keep in mind that Sensodyne Original does not contain fluoride and so should be supplemented with a fluoride containing toothpaste. As you can see, “regular” toothpaste is what most people need unless you have a specific concern or issue. 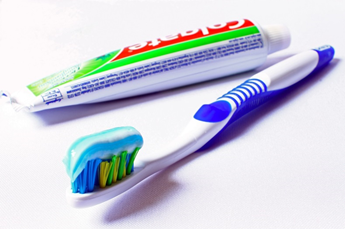 One of our Dentists or Oral Health Therapists can help you in deciding which toothpaste is right for you.